The 7.0 earthquake that razed much of the Haitian capital on January 13 has led to a uniquely devastating humanitarian crisis. 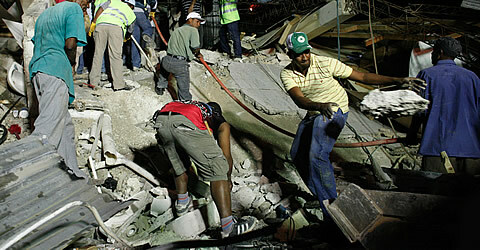 The death toll is still uncertain and estimates range between 50,000 and 500,000. The need for international relief is clear. This tragedy is compounded by U.S. and European intervention into Haitian internal politics, which has caused centuries of poverty and underdevelopment. The vast majority of Haitians are poor and working people, who labor in sweatshops at poverty wages for U.S. corporations like Disney. Their attempts to organize are routinely and violently suppressed. In the capital of Port-au-Prince, many neighborhoods and even the presidential palace, UN headquarters, and the senate buildings lie in ruins. Hundreds of injured Haitians a day are crossing into the Dominican Republic, and hundreds of thousands are displaced within Haiti. U.S. mainstream media are using this disaster to drum up PR for corporate charity, as U.S. banks and corporations send millions to the Red Cross and other relief organizations. While any help that addresses the direct needs of Haitians in trouble is needed and rightly applauded, there is a certain irony in celebrating the charity of corporations that have long-term interests in maintaining the status quo of poverty and pillage in Haiti, the poorest country in our hemisphere. Working people and our organizations in the United States are also organizing to help meet the direct needs of our Haitian brothers and sisters. These appeals for donations and aid come out of solidarity and present an opportunity to relieve some of the immense suffering of the Haitian people. As Haiti begins to rebuild and heal, many of these organizations also look to a day when fights for justice for the poor can create a society where the effects of natural disasters can be better addressed by an independent government with space for unions and other working-class organizations. The Miami Workers’ Center, a community-based workers’organization with Haitian members, would like you to know about Batay Ouvriye, a grassroots worker and peasant organization especially active in the Free Trade Zones and sweatshops. Donating to Batay Ouvriye will strengthen autonomous workers’ movements and popular demands of the poor, lessening the unnatural devastation of poverty and structural racism that makes natural disasters so much worse. You can find out more about Batay Ouvriye at http://batayouvriye.org or make a donation at http://miamiautonomyandsolidarity.wordpress.com. Grassroots International has been supporting Human Rights and other popular organizations in Haiti since 1983. Using these pre-existing networks, Grassroots International can reach people across the island and throughout the most-affected zone to provide direct relief. Please visit http://www.grassrootsonline.org/ to find out more and where to donate. The AFL-CIO Solidarity Center is accepting donations to help Haitian workers and mobilize Haitian unionists living in the Dominican Republic. Donate and read correspondence from someone on the ground. National Nurses United, the largest RN union, is coordinating a nurse volunteer mission to Haiti. NNU Executive Director Rose Ann DeMoro says, “Nurses will be fundamental to the disaster relief process, to provide immediate healing and therapeutic support to the patients and families facing the devastation from this tragic earthquake.” RNs can sign up on the NNU website. Transport Workers Local 100 in New York City, where a sizable Haitian population lives, kicked off their initial donation with $10,000. Concerned people can add to this pool at their website. TransAfrica, a longtime friend of the labor movement, is accepting donations for worthy relief organizations on its website. Along with Jobs with Justice, TransAfrica is calling for a moratorium on deporting Haitians who are living in the United States without proper documentation (which is common in severe natural disasters or wars). Learn more about TransAfrica’s requests. The Coalition of Immokalee Workers is asking for support for a community-based organization, Zanmi Lasante. You can find more information and where to donate at the CIW’s site.